Our low negative feedback WRAT concept breathes life and vitality into your favorite music and soundtracks. It’s the driving force behind the distinctive Onkyo sound. So what isWRAT, and how does it work? Negative feedback amplifiers reduce distortion by feeding the negative phase of the output signal back into the input signal to cancel errors. Although this method is a cheap way to reduce noise, it can inhibit the amp’s ability to reproduce high frequencies. It can also dampen responsiveness, leaving music sounding flat and dull. Our WRAT design instead uses an ultra-low negative feedback circuit. The design expands frequency response, boosts current, and allows audio to blossom with startling energy and realism. Another facet of WRAT is the closed ground loop circuit design to keep the ground potential free of distortion. In a conventional open-loop circuit design—where all circuits share the same link to the power supply—any noise produced by voltage fluctuation is compounded, affecting audio quality. To avoid this, each circuit in the M-5010 has its own separate link to the power supply, cutting noise and promoting more reliable, efficient performance at any volume. Impedance fluctuations and reflex energy from the loudspeakers can force your amplifier to briefly handle four to six times its usual load. If its power supply is not up to scratch, signal clipping can occur and audio quality suffers noticeably. A key element of WRAT is its ability to deliver high instantaneous current, preserving a wide 100 kHz frequency response for expansive performance under the most demanding conditions. An important upgrade to the core WRAT concept is Onkyo’s Three-Stage Inverted Darlington Circuitry, a low negative feedback topology featuring a discrete triple transistor array to cut distortion and boost current flow to the speakers. As well as improving efficiency, transient response, and audio clarity, discrete transistors run cooler, extending the life of your output stage for more years of trouble-free service. A standard integrated amplifier has the dual task of both processing and amplifying audio signals, and is therefore susceptible to interference from digital circuitry. As a dedicated power amp with all-analog circuitry, the M-5010 is protected against digital interference. When partnered with a quality pre-processor, this unit offers all the benefits of pure analog amplification: a warm, musical, and full-bodied sound. From input to output, signal purity is maintained at every stage. Housed in a rigid anti-resonant steel-plate chassis and finished with a tough one-piece aluminum front panel, the M-5010 is highly resistant to vibration. A massive EI transformer delivers a steady supply of power to the speakers, while two large 10,000 μF capacitors, heavy-duty transistors, and low-impedance copper bus bars work in concert to enhance the power and fidelity of your audio sources. A heavy-duty aluminum heat sink keeps the unit running cool for superior reliability and longer life. The M-5010 sports banana plug-compatible speaker posts to ensure a positive connection to the loudspeakers of your choice. The unit is also equipped with selectable audio or 12 V triggers—providing automatic power on/off with your home theater system—plus a rearside level adjustment. 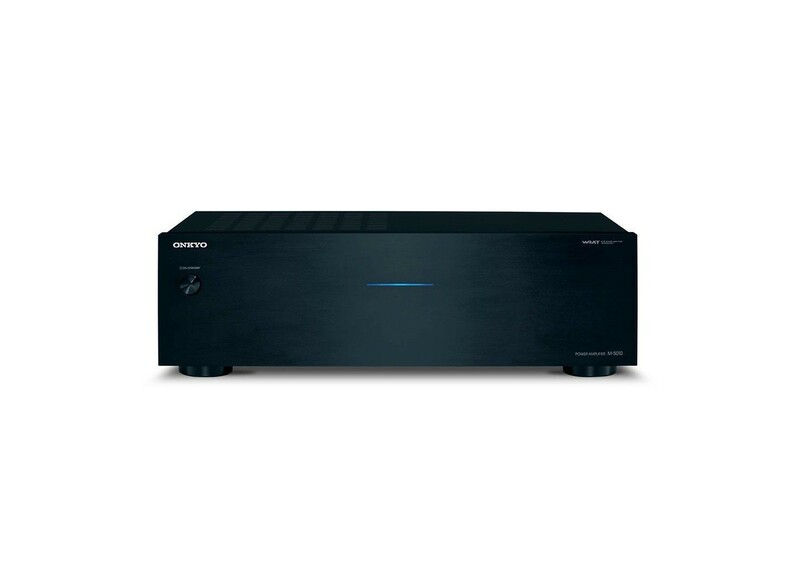 A pair of inputs and outputs provide the multi-room capabilities to which this amplifier is perfectly suited.